Mumbai: Hitachi Systems Micro Clinic Pvt. Ltd., one of India’s leading IT Services and Solutions provider, marked the beginning of its 25th year in India today and brought in the occasion with much aplomb in Mumbai. Dr. Naoya Takahashi, President and CEO, Hitachi Systems, Ltd. and Hitachi Systems Micro Clinic’s Managing Director Mr. Tarun Seth shared company’s journey and future growth trajectory. As an End-to-End IT System Integrator, Hitachi Systems Micro Clinic has emerged as one of the leading IT Services and Solution provider. The company has a strong PAN India presence with 16 branches and 180+ service locations, and plans to grow its operations even further by leveraging innovative organic and inorganic growth strategies. Hitachi Systems Micro Clinic serves diverse IT requirements for industry portfolios including Government/PSUs, BFSI, IT/ITES, Manufacturing, Retail, Online, Media, Hospitality/Healthcare, Automobiles, Travel, and Logistics. Hitachi Systems Micro Clinic’s key strength lies in Hitachi’s strong global brand equity and long term relationships with key OEM vendors such as HP, HDS, McAfee, Microsoft, Cisco, etc. 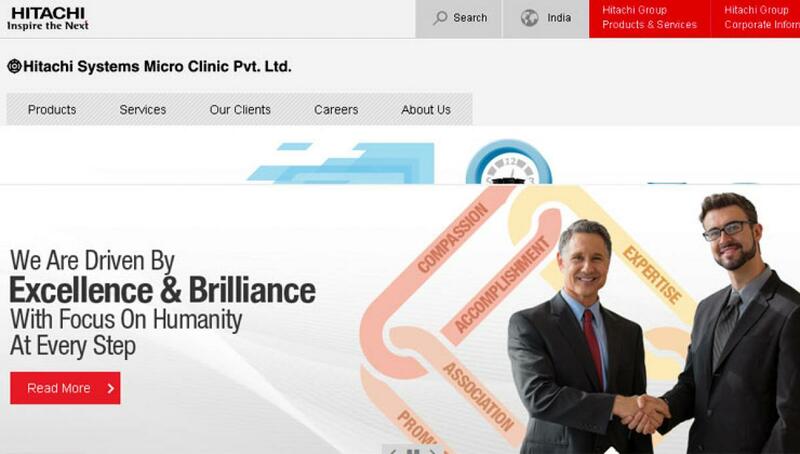 About Hitachi Systems Micro Clinic Pvt. Ltd.
Hitachi Systems Micro Clinic is an end-to-end IT Services & Solution provider that helps businesses upgrade to contemporary IT infrastructure by offering high end solutions in End User Computing, Networking, Servers, Backup & Storage, Virtualization, Security and Services. The company believes in providing the best possible turnaround time to its customers and thus, it operates through a massive network across the country. Established in 1991, the company is headquartered in New Delhi and expands its reach across 16 major cities and 180+ service locations in India with 1000+ customers across verticals. We provide customized solutions to organizations of all sizes thereby reducing cost, increasing business agility and freedom of choice. At Hitachi Systems Micro Clinic, we deliver innovations that answer society’s challenges. With our talented team and proven experience in global markets, we can inspire the world. Hitachi Systems, Ltd. is an IT services company with strengths in high-quality operations and maintenance services. Hitachi Systems works closely with customers through a network of roughly 300 service sites and contact centers across Japan, through which it offers a wide range of business system design and integration services, as well as outsourcing services that take advantage of its robust data center infrastructure. A leader since the dawn of the IT era in Japan, Hitachi Systems leverages its track record and expertise in IT services to offer one-stop services covering the entire IT life cycle - from system consulting to integration, installation, operation and maintenance. Hitachi Systems also pushes beyond the boundaries of IT to create new value for customers, with the aim of becoming a global service company to which customers can entrust any operation.